We normally visit the kids’ thrift store once a week to look for books and clothes. Buying used not only saves money, but is a great way to live a little greener when it comes to kids’ items they outgrow quickly. The past two times we’ve gone, the store has been temporarily closed. So today we went down the road to the regular thrift store run by the same company. They actually had a few children’s books in the book room. We also checked the craft bins and found some buttons. I think the little seed packet buttons would be cute for a quiet book page garden. The My First Word Board Book was a great find, because last night I had to make Jax put his hand-me-down word book in the recycle bin. He kept folding the pages back to open it wider, and it was ripped beyond (re)repair. 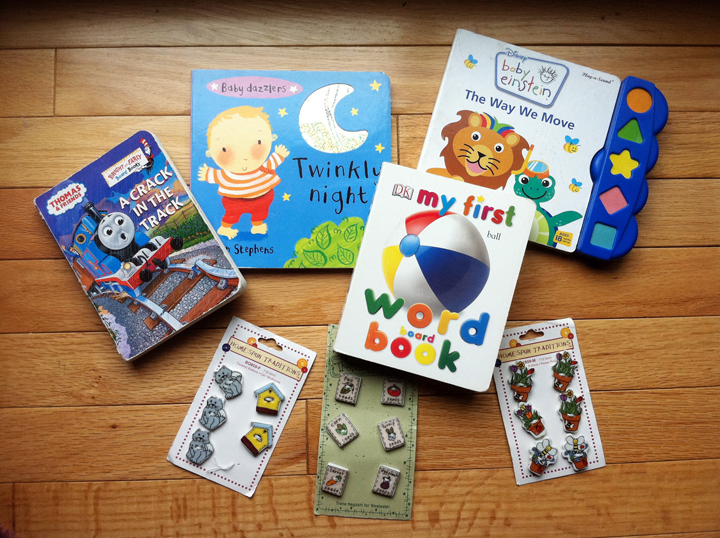 For $4.50 total we got: that word book, 3 sets of ceramic buttons (seed packets, cats/houses and potted plants), Baby Dazzlers: Twinkly Night , a Baby Einstein music book and A Crack in the Track . This entry was posted in Be Green, Thrift Store Gems and tagged Thrift Store on September 26, 2011 by Stephanie. Wow…I’m so envious of you…I’m currently living in the Middle East and there are no thrift stores around here… I have a 2 year old daughter and I think she would enjoy those lovely books…and those buttons! I cant find anything like them even in regular craft stores! sigh! btw, I stumbled across your blog while googling ‘quiet book’ for my next quiet book project (have already made 2 ), Have to say I’m really impressed by your lovely and unique, not the regular kind of quiet book pages that uve created….Keep up the good work! this is one blog I intend on returning to on a regular basis. Thanks! I’m having so much fun making pages for Jax’s book! for sharing your talent with me! !